This has been the most amazing summer! Our fantastic Oakville weather has been perfect for golf games, bike rides, swimming, reading by the pool and entertaining friends and family in the garden. I have enjoyed every minute of it. But with all of these great outdoor activities, I have neglected the many jobs inside. So I was actually happy when I woke up Saturday morning to rain. This would be the day when I would start to tackle my to do list. 1. I went to the gym. I haven't been for many months as I usually power walk when the weather is nice. But it was time to get reacquainted with the gym and work a little harder. 2. I purged and cleaned out my make-up drawer. I bought clear acrylic trays from Solutions so everything would have its own space. As you can see, I am a Laura Mercier make-up girl. 3. 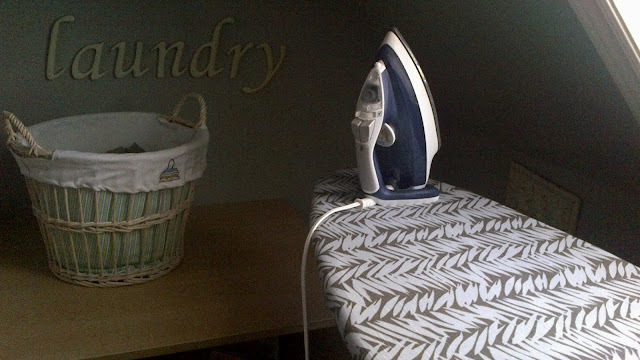 Not only did I do 2 loads of laundry, I bought a new extra wide 18" ironing board. I love my new ironing board. It is extra wide and also very high, which is great since I am tall. Then I covered it with beautiful printed linen fabric. 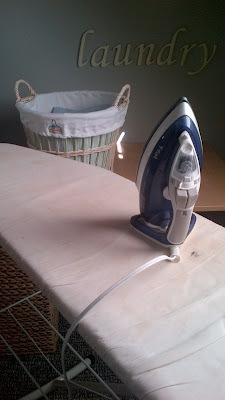 It took less than 1 yard of fabric and if your board is regular size, 1/2 yard will do the trick. Love it! 4. I downloaded some new songs on my iPod - some oldies like 'Band on the Run' by Paul McCartney and some new ones like 'Slow' by Rumer, 'Too Close' by Alex Clare and 'One More Night' by Maroon 5. 5. And finally, I wrote several blog posts...stay tuned. So I was able to cross off a few things from my list but there is lots more to do. However, Sunday will be a day of rest - after I do a yoga class.